The new BMW X5 has already raised efficiency to a whole new level in the world of the luxury Sports Activity Vehicle (SAV). BMW is using the New York International Auto Show 2014 to present what it sees as the logical next step towards bringing about a radical reduction in fuel consumption and emissions in the SAV segment. 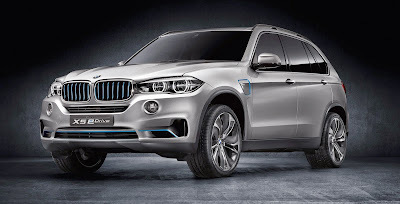 The BMW Concept X5 eDrive succeeds in fusing the familiar brand of driving pleasure generated by the xDrive intelligent all-wheel-drive system and a luxurious ambience enshrined within an interior offering tremendous versatility of use with a plug-in hybrid drive system. A conventional combustion engine works together in perfect harmony with the cutting-edge BMW eDrive technology to produce the brand's hallmark sporty drive coupled with a significant reduction in fuel consumption, making it an impressive example of the effectiveness of the BMW EfficientDynamics development strategy. As a result, the car is able to drive on electric power alone at speeds of up to 120 km/h (75 mph) and for a distance of up to 30 kilometres (approx. 20 miles), while recording average fuel consumption figures of less than 3.8 l/100 kilometres (more than 74.3 mpg imp) in the EU test cycle. The concept study underwent a series of detailed refinements in preparation for its appearance at the New York International Auto Show and is equipped with a drive system comprising a 180 kW/245 hp four-cylinder petrol engine with BMW TwinPower Turbo technology and a 70 kW/95 hp electric motor likewise developed by the BMW Group. The motor is supplied with power from a lithium-ion battery that can be charged from any domestic socket and has sufficient capacity to enable all-electric driving with zero local emissions for a range of up to 30 kilometres (approx. 20 miles). To ensure a particularly high level of crash safety, the high-voltage battery developed for the BMW Concept X5 eDrive is housed underneath the luggage compartment, whose everyday usability remains virtually uncompromised thanks to the 40:20:40 split-folding rear backrest and an almost level loading floor. In addition to the settings that can be activated using the characteristic BMW Driving Experience Control switch, three driving modes can be selected according to requirements and the situation at hand: intelligent hybrid drive with an optimal relationship between sportiness and efficiency (AUTO eDrive), pure electric and thus local emission-free driving (MAX eDrive) and SAVE Battery to maintain the current charge level. Majestic poise at its most sophisticated: dynamic, flexible, luxurious, plus zero local emissions if required. Thanks to the BMW eDrive technology that has been specifically honed for this model as part of the BMW EfficientDynamics strategy, the concept car brings a whole new brand of poise and assurance to the SAV segment. The formidable power reserves produced by its duo of drive units, its outstanding levels of motoring comfort and the optimised traction, handling stability and dynamic performance qualities over any terrain courtesy of BMW xDrive technology all endow it with the all-round sporty prowess typically associated with BMW X models, while its landmark efficiency blazes a trail for its rivals to follow. The ability to operate purely on electric power with zero local emissions, especially in city traffic, puts a whole new slant on the SAV driving experience that shows the shape of things to come. At the same time, the plug-in hybrid drive concept does not impinge in any way on the exemplary versatility offered by the Sports Activity Vehicle's interior or its distinctly luxurious ambience. In short, the BMW Concept X5 eDrive shows itself to be supremely talented in every way, deftly bringing major advances in cutting fuel consumption and emissions into harmony with state-of-the-art functionality and everyday practicality that never fails to impress. A number of understated styling touches have been meticulously incorporated into the exterior design to underline the groundbreaking character of the BMW Concept X5 eDrive. The kidney grille bars, air intake bars and the insert in the rear bumper are all finished in the BMW i Blue colour developed for the BMW i brand, for instance, creating a stunning contrast to the Silverflake metallic exterior paintwork. 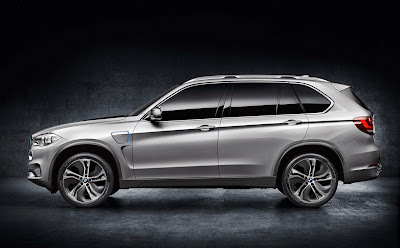 The BMW Concept X5 eDrive also comes with body-coloured wheel arches, specially styled roof rails, a connector for the charging cable which – as on the BMW i models – lights up during charging, as well as 21-inch light-alloy wheels in an exclusive, streamlined design. To make sure that the styling of the luxurious passenger compartment echoes the highly sophisticated drive concept, light blue double-felled seams adorn the Ivory White exclusive leather upholstery covering the seats, door trim panels and dashboard. Further highlight features of the specially designed interior include the Piano Finish Black interior trim with blue accent strips, "eDrive" lettering embossed in the front of the headrests, ambient lighting with a blue hue, and an eDrive button that is also illuminated in blue. In the luggage compartment lined in black velour, a transparent cover – again illuminated in blue – affords a clear view of the high-voltage battery for the electric motor. BMW eDrive in a Sports Activity Vehicle: intelligent hybrid technology promises outstanding efficiency and hallmark driving pleasure. Electrification of the powertrain is a key component of BMW EfficientDynamics technology and allows BMW to unlock tremendous potential for reducing fuel consumption and emissions. The BMW eDrive technology developed for this purpose comes in various versions, each precisely tailored to the particular vehicle concept. Both the BMW i3, the first all-electric production vehicle from the BMW Group, and the soon-to-be-launched BMW i8 plug-in hybrid sports car are powered by BMW eDrive technology. The BMW Concept X5 eDrive now follows in the tyre tracks of the BMW Concept Active Tourer unveiled in 2012 by demonstrating how model-specific BMW eDrive technology can be employed in plug-in hybrid models from the BMW core brand. This is the first time that BMW eDrive technology has been hooked up with the BMW xDrive intelligent all-wheel-drive system. The BMW Concept X5 eDrive boasts the superior driving characteristics that stem from the permanent and fully variable distribution of drive power between the front and rear wheels. Regardless of the selected driving mode, the drive power generated by the electric motor, the combustion engine or the two units acting in unison is channelled swiftly and precisely to wherever it can be converted into forward propulsion most effectively. This allows the concept study to deliver all the qualities that SAVs are renowned for – superb traction and optimised handling stability in all weather and road conditions coupled with enhanced agility when taking corners at speed – in remarkably efficient fashion. The highly versatile and sporty driving abilities of the BMW Concept X5 eDrive are accompanied by average fuel consumption in the EU test cycle of less than 3.8 l/100 km (more than 74.3 mpg imp) and CO2 emissions of under 90 grams per kilometre. 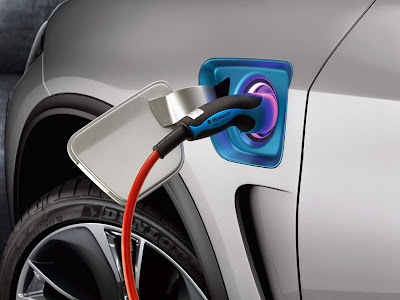 Both driving pleasure and efficiency in the BMW Concept X5 eDrive are given an extra boost by an electric motor generating a maximum output of 70 kW/95 hp together with the instantaneous power delivery that has become a hallmark of electric drive units thanks to the high levels of torque available from the word go. The electric motor variant developed for the BMW Concept X5 eDrive as part of the BMW EfficientDynamics strategy also boasts sporty performance credentials, a compact design and optimised weight. The electric motor alone is capable of propelling the BMW Concept X5 eDrive to a top speed of 120 km/h (75 mph). With 250 Newton metres (184 lb-ft) of torque on tap from stationary, it gives the vehicle wonderfully spontaneous response that translates into thrillingly dynamic acceleration. It also works in tandem with the combustion engine to boost its power significantly whenever a quick burst of speed is called for. The BMW Concept X5 eDrive is able to complete the standard sprint from rest to 100 km/h (62 mph) in under 7.0 seconds. The task of ensuring the engine and electric motor team up together to optimum effect is handled by the power electronics that were developed by the BMW Group and apply the same basic concept used in the BMW i cars. The power electronics combine a liquid-cooled inverter for driving the electric motor, supplying energy to the onboard electrical system from the high-voltage battery and for centralised control of the hybrid-specific drive functions into a single integrated system. As in other members of the current BMW production line-up, the Driving Experience Control switch in the BMW Concept X5 eDrive can be used to select not only the COMFORT and SPORT settings but also the ECO PRO mode that fosters a particularly economical driving style. This driving mode is programmed for highly intelligent hybrid functionality, whereby the energy management system orchestrates the interaction between engine and electric drive unit as the driving situation changes in order to maximise efficiency. As a further component of the BMW EfficientDynamics technology, a hybrid-specific Proactive Driving Assistant has also been included, which works together with the navigation system to allow the route profile, any speed restrictions and the traffic situation to be factored in as well for the purpose of drive management. In addition to this, the driver also has the option of engaging the all-electric driving mode by switching from AUTO eDrive to the MAX eDrive setting at the push of a button. With the battery fully charged, the vehicle is able to cover a distance of up to 30 kilometres (approx. 20 miles) on electric power alone, which means zero local emissions. There is also a SAVE Battery mode, which can be selected to deliberately preserve the battery's energy capacity. This might be the case, for example, if a longer journey is due to end with a final stage through urban traffic that drivers wish to complete in all-electric mode. Everyday usability: flexible charging scenarios and impressive viability. In order to capitalise as much as possible on the superior efficiency of its electrified powertrain, the BMW Concept X5 eDrive is designed as a plug-in hybrid, allowing its high-voltage battery's energy levels to be renewed from any domestic power socket, a special Wallbox that can handle higher currents, or at a public high-speed charging station. The Wallbox Pro is designed for installation in the customer's garage and offers complete ease of use as well as exceptionally short battery recharging times, thanks to a maximum charging rate of 7.4 kW. It is controlled by means of a high-resolution touchscreen including proximity sensor, while LED light strips provide an additional indication of the charge status. The built-in load management facility governs the charging current in accordance with the current draw on the household electricity supply. The Wallbox Pro even makes it possible to use home-generated electricity, such as that obtained from solar panels. There is also a function for creating different user profiles and displaying the respective charging histories. On request, the corresponding data can be sent online, e.g. for billing purposes. The high degree of flexibility drivers can enjoy when it comes to choosing an energy source is given an added boost by the charging cable that is carried in the vehicle. The battery unit is located underneath the luggage compartment, so that there is only a small loss of load capacity overall – the luggage compartment is able to hold two large suitcases or four 46-inch golf bags. The SAV's excellent versatility – helped by the 40:20:40 split-folding rear backrest – has been fully retained, along with its ample sense of spaciousness and the impressive level of comfort offered to the occupants of all five seats. Intelligent connectivity for yet greater efficiency. Innovative functions from BMW ConnectedDrive assist with planning journeys in such a way as to maximise the amount of time spent driving on electric power alone. In the BMW Concept X5 eDrive, the current electric range thus appears as a numerical value in the instrument cluster. Intelligent connectivity enables the vehicle's dynamic range display to constantly make allowances for any factors affecting the range, such as traffic conditions, route profile and driving style. When route guidance is activated, the location of local charging stations is added to the selection of points of interest shown on the navigation map. Drivers are able to call up charging stations situated along the planned route or at their destination, while the system additionally notifies them of the charging time needed to fully replenish the battery's energy levels. Furthermore, information graphics indicating the current operating status when engine and motor work together in unison, the impact of the driving style on vehicle efficiency and the fuel consumption history for selected periods of time can be shown in the iDrive operating system's Control Display, along with other information. Drivers are also able to view all information relating to the battery's charge level and electric driving range on their smartphone. A Remote app from BMW ConnectedDrive that has been specially designed with electric mobility in mind even enables them to control the charging process from their phone. It also allows the vehicle to be pre-programmed whenever it is connected to an electricity supply: the heating and air conditioning systems can be activated remotely in this way to get the passenger compartment to a pleasant temperature ready for the start of the journey.